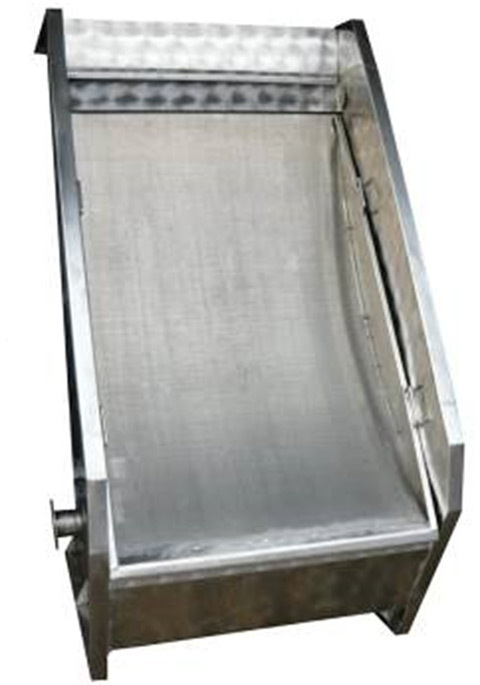 The wedge wire screen is designed for preliminary waste water treatment in various branches of industry, and in particular in poultry slaughtering, meat processing and waste water treatment plants. The device is equipped with a high capacity balance tank, for reducing waste water turbulence. In the upper part of the chamber, there is an overflow, used for directing the stream to the filter element. An adjustable aperture ensures even flow along the entire width of the strainer and prevents rapid flow of the liquid. The suspension is separated from the liquid when passing through a specially shaped filter element. Solid particles flow down by forces of gravity and the separated liquid flows into the main chamber of the device. The size of captured solids depends on the slot size and can be: 0.25mm, 0.5mm, 1mm, 1.6mm or other. The filter element used is characterised by very high precision of slot size and very high smoothness of the working surface. Simple design and high-quality materials ensure easy and reliable operation of the device. * capacity for clean water and slot width of 0.5mm.